After the E3 Harelbeke and Gent-Wevelgem, another WorldTour race in Flanders is coming up: Dwars door Vlaanderen. 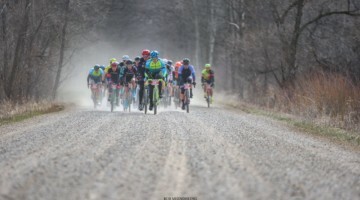 While some riders, like Wout Van Aert, take a breath with the Tour of Flanders coming up on Sunday, Dwars door Vlaanderen is the last preparation for the Tour of Flanders for others, including Mathieu van der Poel, who finished fourth in the sprint on Sunday at Gent – Wevelgem. For the women, Trek – Segafredo Women rider Ellen van Dijk is back to defend her title and bring home a win for her new team. In this article, we dive in some history of the race and take a look at the course of this year’s Women’s and Men’s races. Like nearly all European races, the Women’s race is a relatively new addition. Like Gent – Wevelgem, the first Women’s race was held in 2012. Dutch rider Amy Pieters (Boels – Dolmans) is the record holder, with three wins at the West Flemish race. The Dutch have been dominant at Dwars Door Vlaanderen, with only Finnish rider Lotta Lepistö (Trek – Segafredo Women) breaking their hold on the race in 2017. Both Lepistö and last year’s winner Van Dijk return this year. 2013 winner, and winner at Gent – Wevelgem, Kirsten Wild (WNT Rotor Pro Cycling), is not on the provisional start list. Pieter’s Boels – Dolmans team is taking a pass on the race with the Tour of Flanders on Sunday. With both Lepistö and Van Dijk on its roster, the race provides a good opportunity for the new Trek – Segafredo Women team to pick up a marquee win. For the men, the last four editions of Dwars door Vlaanderen with its finish in the West-Flemish city of Waregem were all won by West-Flemish riders. Jelle Wallays (Lotto Soudal) won in 2015, former Belgian national champion Jens Debusschere (Team Katusha – Alpecin) won in 2016 and current Belgian national champion Yves Lampaert (Deceuninck – Quick-Step) won in 2017 and 2018. Since the first edition of the race in 1945, 13 riders male riders have won the race twice. Two of those 13 riders are still in the current peloton and are riding the 2019 edition as well. Last year’s Tour of Flanders winner Niki Terpstra (Direct Energie) is one of them. He won Dwars door Vlaanderen in 2012 and 2014. The other one is the Lampaert, who won the last two editions. If one of them wins the 2019 edition, he will join Van Dijk as the record-holder with three wins. Van Aert is likely glad he is not racing after his rather remarkable crash in the 2018 race. The course of this year’s Women’s race has a length of 108 km, which is a bit shorter than last year’s 118 km route. 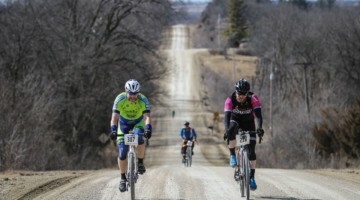 The route includes six hills and two cobblestone sections. The last 20km includes two climbs. The penultimate climb is the Holstraat at 16 km to go (mislabeled on the map below), and the final climb is the Nokereberg (0.5 km, avg. gradient: 5.7 percent, max gradient: 7 percent), located just 9 km from the finish. 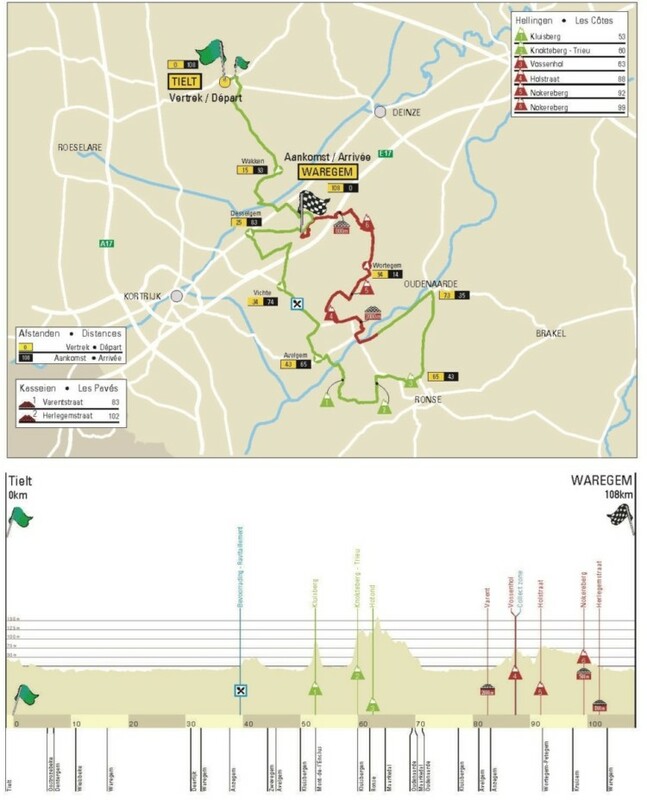 Once over the Nokereberg, the riders will face the cobblestones of the Herlegemstraat (0.8 km) before hitting the final 6 km to the finish in Waregem. The Men’s course has a length of 183 km, has 11 climbs and 4 cobblestone sections. A few of those 11 climbs have cobblestones as well. The Knokteberg (1.1 km, avg. gradient: 8 percent, max. gradient: 11 percent), where Thijs Benoot (Lotto – Soudal) and Greg Van Avermaet (CCC Team) attacked last year, will be climbed twice this year, once after 118 km and once after 149 km. In between the two times climbing the Knokteberg, four other climbs, out of which three are paved ones, will await the riders. One of those paved climbs is the Taaienberg (0.8 km, av. gradient: 7.1 percent, max gradient: 18 percent), which will probably be a decisive climb in this year’s edition. In last year’s edition, Zdenek Stybar put on a show on that climb. 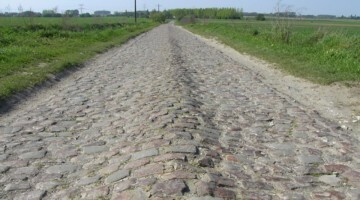 After the last time up the Knokteberg, the 2 km cobblestones of the Varentstraat are the next obstacle. After that 4 more obstacles are remaining, all within the last 21 km: first the climb of the Vossenhol, then the climb of the Holstraat, then the paved climb of Nokereberg and last but not least the cobblestones of the Herlegemstraat, less than 7 km from the finish line. Just as last year, World Champion Alejandro Valverde, will race in Dwars door Vlaanderen. Will he attack again in possibly another rainy edition? Wednesday evening we’ll know more. 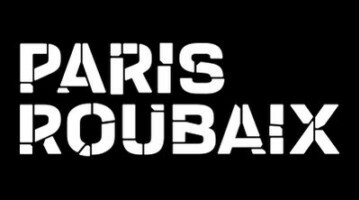 The Women’s race will be broadcast in its entirety via the Proximus Sports Facebook page. The race starts at 1:15 p.m. Belgian time (7:15 a.m. EDT). The Men’s race is available via fubo.tv and Flo Bikes. Coverage of the Men’s race starts at 2:15 p.m. Belgian time (8:15 a.m. EDT).